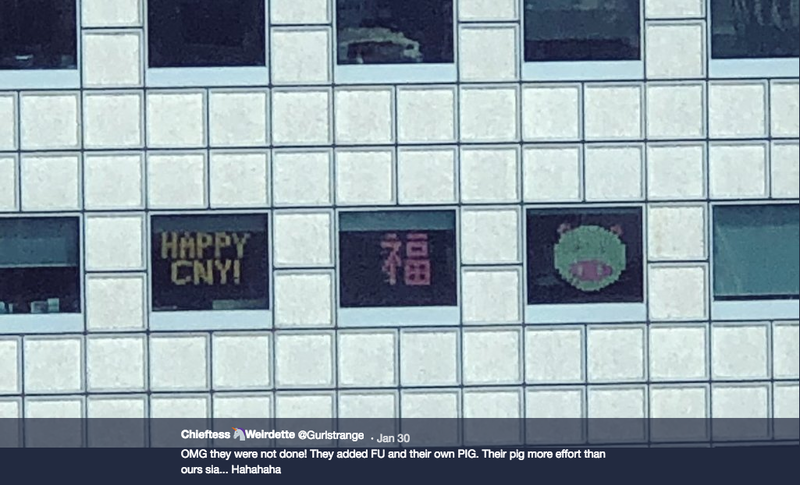 Suntec City office workers had a unique way of gearing up conversations, as they put up Post-it notes on their windows. 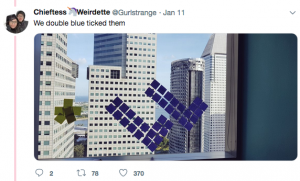 The windows of offices in high-rise buildings Suntec City Towers 1,2, and 3 were decorated with giant words and figures drawn from Post-it notes. 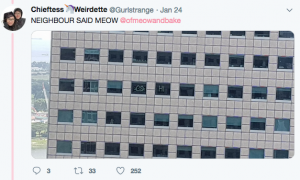 Twitter user @GurlStrange has managed to document the exchanges on their windows. 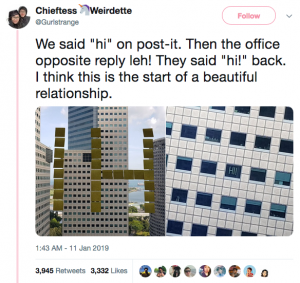 It started “Hi” on Jan 11, just like how any conversation should start. It got an unexpected reply of “Hi” back, yet expectedly, a reply should be. This was followed by a double tick and a thumbs-up. Now, exchanges are on the go. 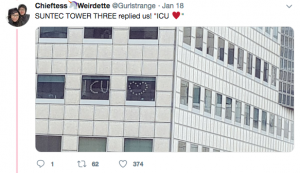 They say ‘three is a crowd’, as somebody in Tower 3 joined the conversation with an “ICU (I see you)” along with the heart icon <3, spotted by the Twitter user. Who would not use emojis in this paper talk? Post-its were totally the thing of the day. Cute figures of a cat and a smiley definitely made the long-distance paper chat alive. 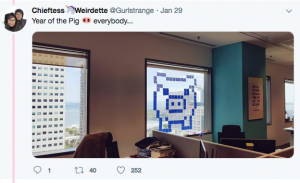 An ode to the Pig for this Year of the Pig was ‘post-it’ed by @Gurlstrange and her colleagues. Someone replied with a ‘more’ post-it pig drawing. 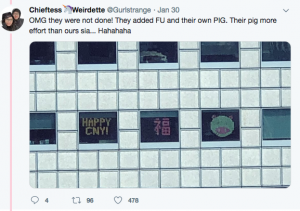 A pig’s head out of pink and white post-its, the Chinese character “Fu” which means fortune and signed off with a message that reads “HAPPY CNY!” was totally amazing from afar. In a concrete jungle, the world is still small and certainly, not an excuse to talk and make friends. A Post-it can help a lot, sometimes. The friendly netizens online have also ‘post-it’ed their comments. 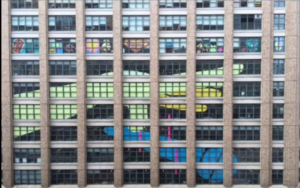 Like the different figures on the building windows, their comments were varied too. Others found it nice, cute, and funny while others seemed to question the time for doing such an effort. This post-it conversation was not a first. 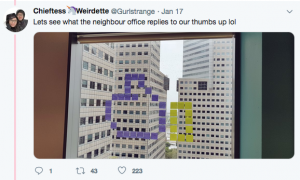 In the US, a post-it war between two office buildings ended with an epic finale.